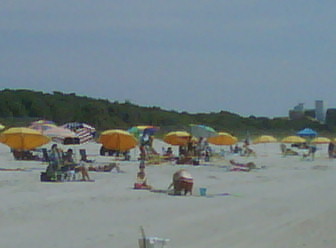 My husband says a beach is a beach and that if you’ve seen one, you’ve seen them all. I say, “No way, Jose.” While there are some common features, each shoreline is just a little different from all others. Because of his attitude, my other half missed out on some beautiful sights last weekend. 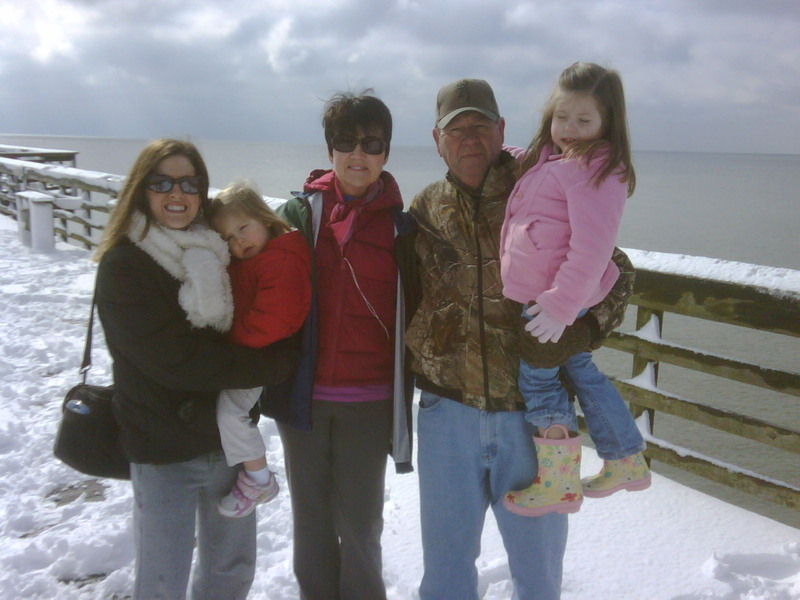 We went to the Morehead City/Beaufort, NC area with some family members to celebrate my brother’s birthday and my husband’s retirement. 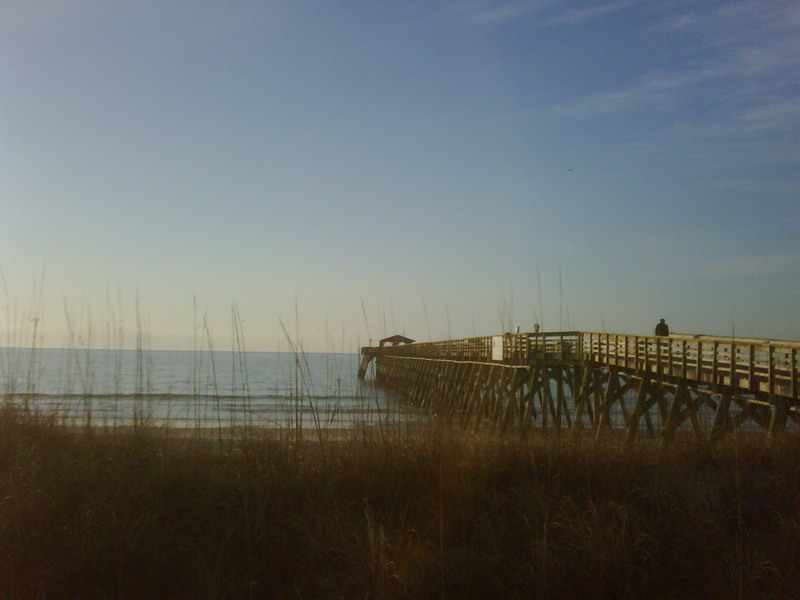 It’s a lovely area, and although our primary purpose was to share a six-hour cruise excursion, we oohed and aahed like the tourists we were as we walked the downtown streets gawking at the pretty sights of Beaufort. We parked the car in the parking lot of FBC, and the “girls” and I chatted about how cool it would be to live in one of the charming homes and saunter over to church on Sunday morning. Afterwards, we might stroll down to the coastline and watch the harbor action. Everything was so clean, neat, and well-preserved. 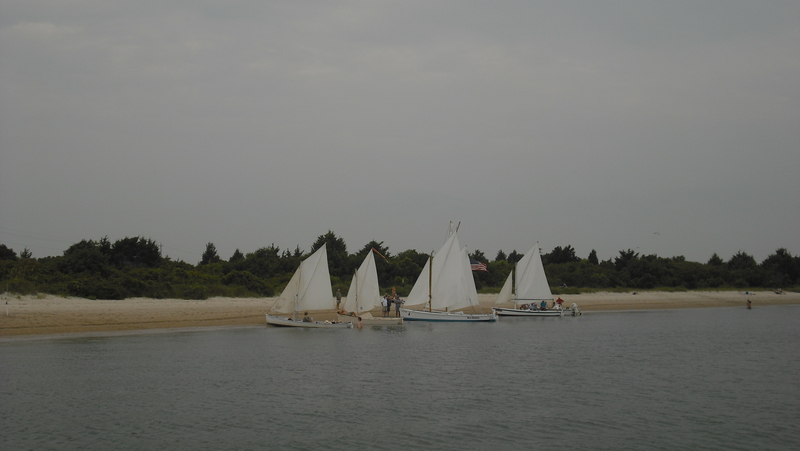 We climbed aboard a catamaran that accommodated 42 people and began our sail out into the ocean. That was a stupendous adventure and one I’d recommend to everyone (more on this later). After about an hour and a half, we reached Lookout Island, and our captain gave us some tips about shelling and instructed us on when to be back. The first moment that I set foot on the island, I was agog at the sight and “feel” of the place. 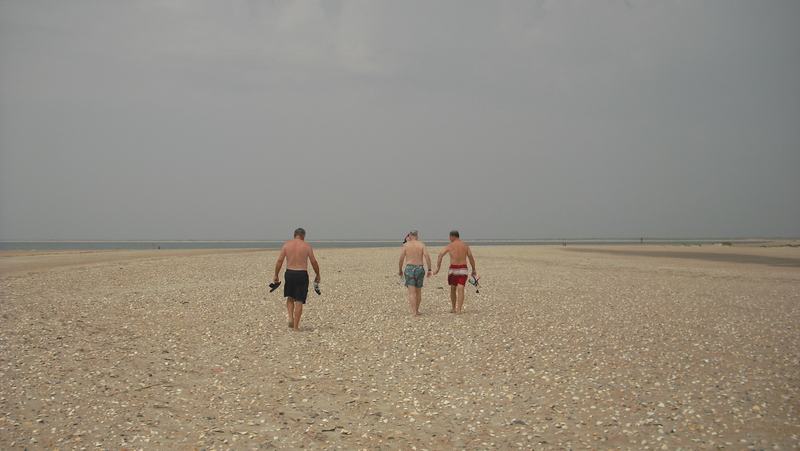 All I could see was beach, beach, and more beach…a wide expanse of sand and shells. I looked down, and there were hundreds, no thousands, of shells of all types and sizes. The captain had provided shell bags for us, and I started collecting them right away. In fact, I became so involved with examining and bagging them that the rest of my party left me to go snorkeling. I probably walked a mile or more around the island gathering shells, watching people frolic in the ocean, chatting with fellow travelers, and listening to my sisters-in-law laugh as they enjoyed their snorkeling experience. There was also a bird sanctuary on the island that I didn’t enter; however, I did stand there for a while taking in the isolated beauty of the area. In the background, there was always the constant, repetitive sound of the ocean lapping on the sand. Calming, very calming. 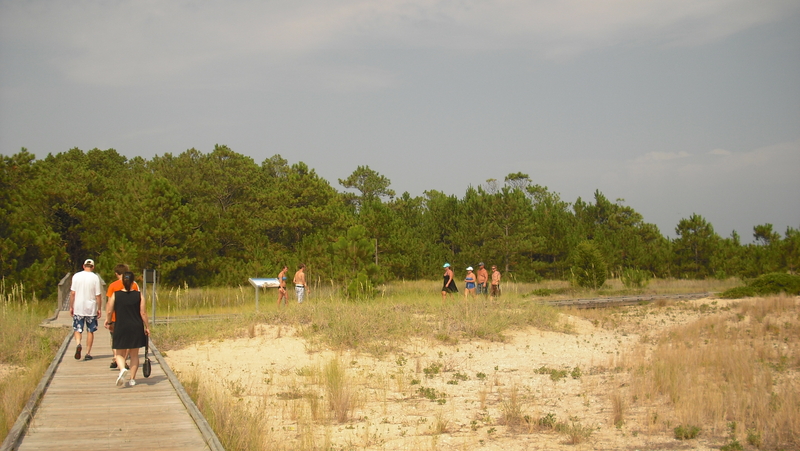 Our next destination was Cape Lookout, part of the National Park Service. It too was breathtakingly beautiful. We bought a few souvenirs in the gift shop and then walked down pathway to the museum. Loved it. This is where my husband and I parted company. This is where he said, “If you’ve seen one beach, you’ve seen them all.” He sat in a rocking chair on the porch of the museum while I climbed the steps to lighthouse. Once at the top of the steps, I could see the ocean, and there was no way I could leave without seeing it up close and personal. I clamored down the steps and made my way down the path and over the small incline to get a look at the Atlantic Ocean. 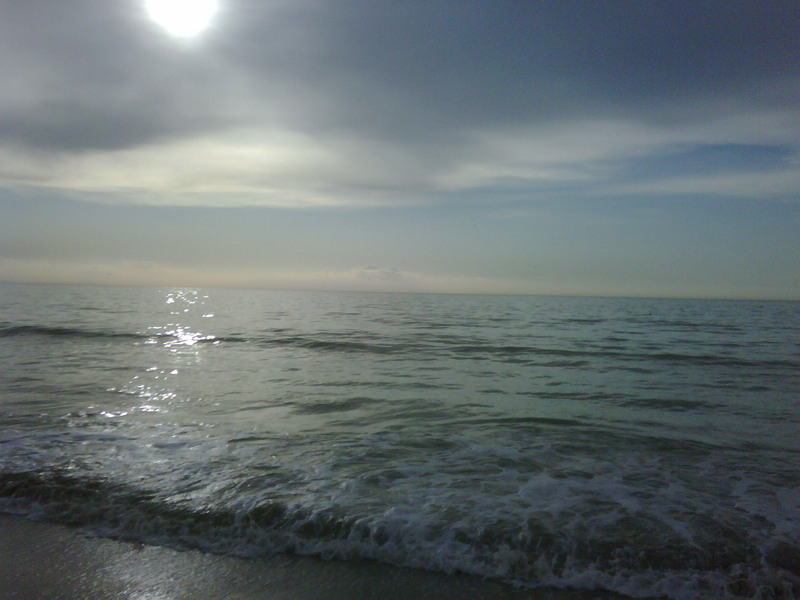 On this particular afternoon, the sea was calm, and the beach was flat. The water was amazingly blue, and if we’d had more time, I’d have “sat a spell.” Lisa and I walked in the water up to our knees and headed back to civilization…or to the boat, that is. This morning I’m wondering what’s more civilized, a natural habitat along the side of a continent or a city teeming with people, restaurants, cars, hotels, hospitals, museums, and shops. Both have their pluses, of course. I couldn’t go for too long without the busy, buzzy world I usually inhabit. At the same time, it’s reassuring to know that there are sanctuaries where one can find serenity and calmness. 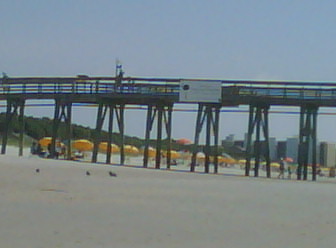 Visiting these Morehead City and Beaufort was awesome. Walking their beaches was a highlight of my summer, and I hope to repeat the experience in the not-too-far-distant future. One of the men I met on the sailboat was from Ohio, and he said he and his family have been coming every year for ten years. So do some friends of theirs, also from Ohio. 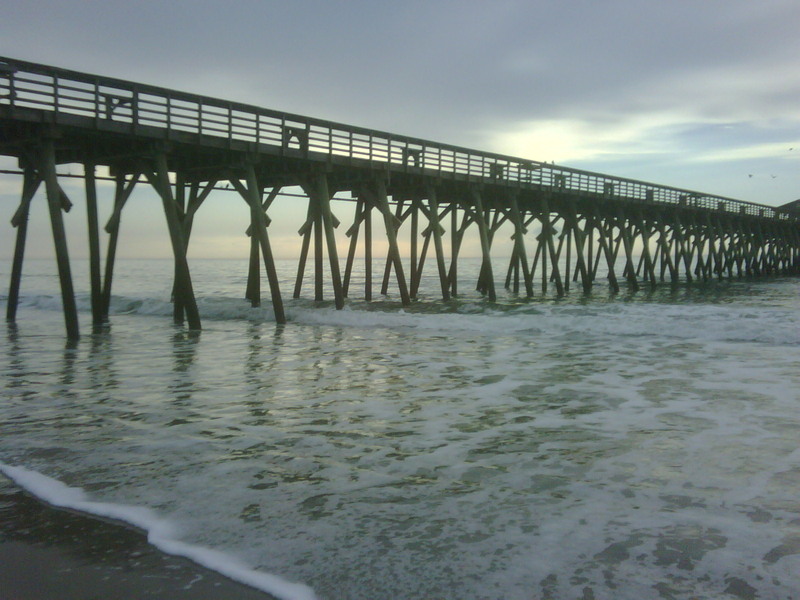 It’s amazing to think of people coming from so far away to visit the Crystal Coast when there are people in SC, NC, and VA who have never experienced its beauty. You might consider it for your next getaway. It’s a “shore thing” that you’ll enjoy it. I saw something Saturday afternoon that defies description. Sounds like a hackneyed phrase, but still…it was awesome. Stressed to the max, I escaped to the beach for about an hour. Why stressed? The end of the semester with six classes (make that seven when you add the online one from another college), Elizabeth’s house closing and all the puzzle pieces that went into that, and then learning that my beautiful young niece had being stricken with spinal meningitis. We didn’t know whether it was bacterial or viral at the time; we just knew that she was in excruciating pain and running a high fever. There were other issues going on too, stuff I’d rather not go into at the moment. I needed my mama to talk to! So what did I do? I went to the strand to walk and think and pray until I regained my usual optimistic perspective. Surely I’d find some solace there. I walked for a while and then sat in my trusty beach chair to read. After a few moments, I closed my eyes and enjoyed seeing the vibrant oranges and reds and pinks, a regular light show going on behind my eyelids. I don’t how the retina’s cones provided that, but the show was magnificent. Eyes still shut, I became more aware of the squawking seabirds, the laughter of playing children, the roar of the ocean, and the muted, constant hum of nearby conversations. 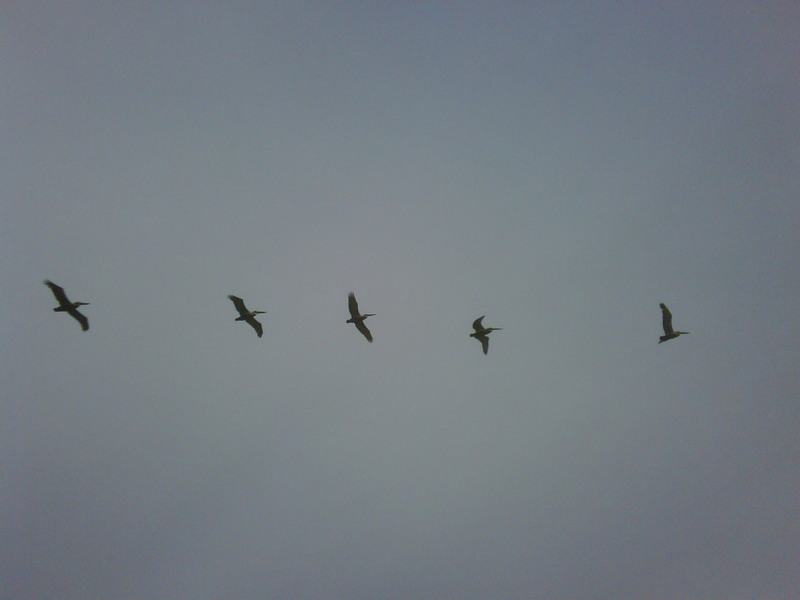 Leaning back, I opened my eyes and saw a breathtaking sight, four pelicans gracefully gliding above me. Between me and a cloud, their movements seemed almost languid, and yet they were moving along at quite a clip (compared to humans). As the one in front lifted its wings, then the one behind followed, and the one behind, and then….you get the picture. It was a beautiful sight and one I’ll never forget. Even this morning, as I think of their unity as they moved gracefully across the sky, I feel peace. I could take a lesson: Stay together, be cool, move at a decent (not unduly rushed) state, and glide…just glide. Things will work out. Sarah Beth is on the mend, Elizabeth moved in her new home over the weekend, and well, things are moving steadily forward with my end of semester stuff. I’m gliding along. Yesterday’s worship service was a bit unconventional in that I didn’t actually get dressed in my Sunday best, drive to church, and enjoy talks, hymns, prayers with others. Nope. 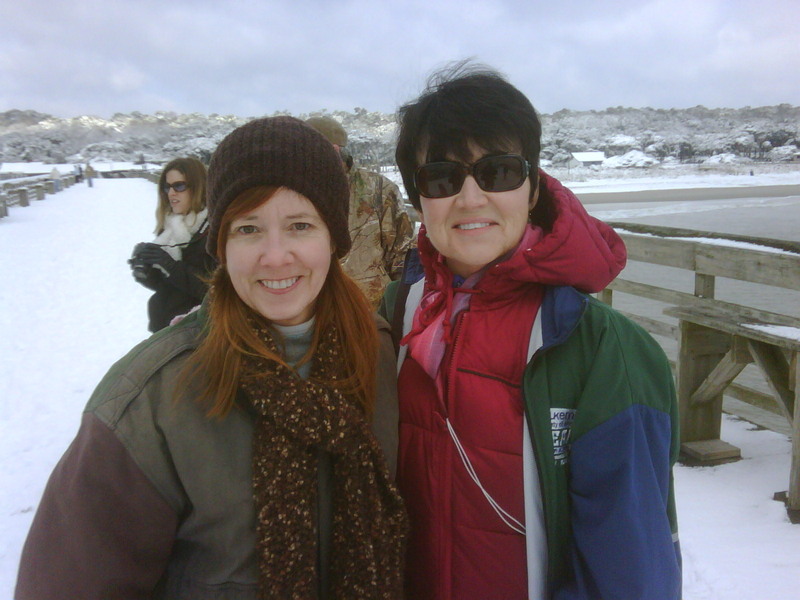 I needed a “closer walk” yesterday so I went to the seashore and saw God everywhere. He was in the roar of the ocean, the seabirds gently floating on the water, the small white birds looking out to sea, the people collecting shells, the sun on the horizon, the sea oats, the sun glinting on the wave tips…and so on. The birds flying overhead in V-formation were awesome too. I walked (more like sauntered) along and thought for the umpteenth time of what a beautiful world our Creator designed for us. I also thought of those verses in Psalms where we’re told that we can never go from His spirit or flee from His presence…not even in the uttermost parts of the sea. He always knows where we are and what we’re up to. I thought of how fortunate I was to have legs, lungs, and a heart that allowed me to stroll along and enjoy the majesty of the morning. I thought of how angry the sea can be at times and how Christ, the Master of earth, ocean, and sky, calmed it so many times. I also thought of how much Christ apparently loved the seashore as much as I do because he sure spent a lot of time there. Refreshed and calm, I left the strand and headed home. Today I’m looking at the tiny shells I collected and remembering the peaceful, yet almost joyous, feeling I had when I picked them up, still wet and fresh from the sea. A few people who didn’t know the MB Marathon was cancelled because of snow (yes, you read that right) have asked me how I did. Actually, I did just fine because I wasn’t under any pressure to achieve a personal best or even to go the whole distance. I just enjoyed the scenery and the experience. Here’s what happened. As we were dining on delicious Mexican food at Abuelo’s on Friday night, the snow began to fall, and as we were enjoying our papas and enchiladas, the downfall became so heavy that the truck (yes, we were in my hubby’s truck) had a couple of inches of accumulation by the time we left. I’m serious. Naturally, my husband the planner wanted to talk about contingency plans for Saturday morning. The marathon was to begin at 6:30 a.m., and he always drops me off around 6:00 or a few minutes after. Even under optimal conditions, the traffic is horrendous, and we both knew that the snow could make it a nightmare. I managed to push negative thoughts out of my mind and insisted that there was nothing to talk about because the show would go on, so to speak. 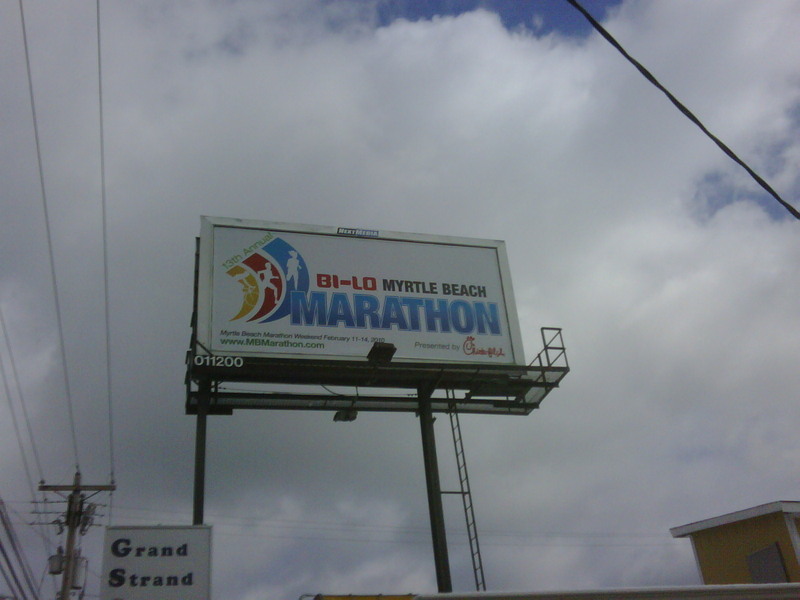 In disbelief, I read the words across the bottom of the screen: “The Myrtle Beach Bi-Lo Marathon has been canceled.” I probably stood there looking like a dork for several seconds. I literally couldn’t comprehend that all of the training and anticipation had come to naught. 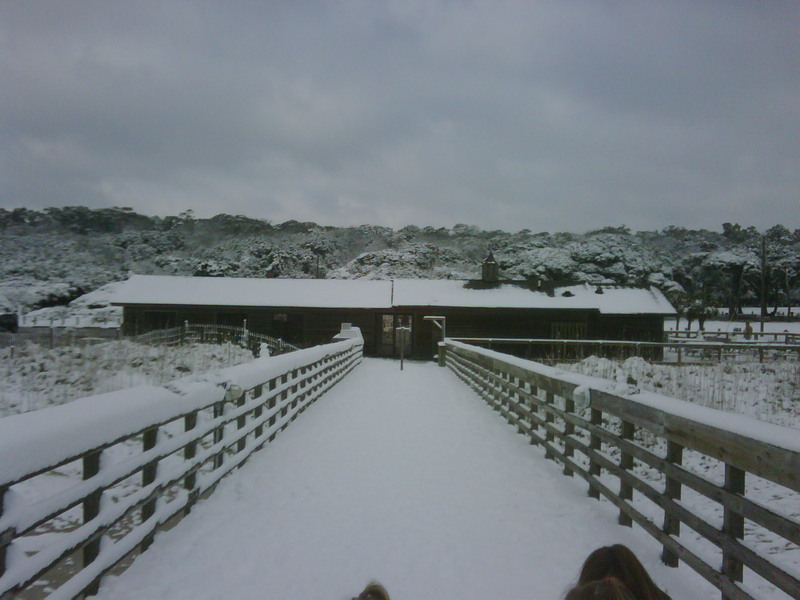 Yes, there was snow for the first time in ages, and yes it was breathtakingly beautiful, but….Well, you get the picture. I was upset (a nice all-purpose word). Within a few moments, I had accepted the situation and had begun to think of it in other ways. After all, the streets and beaches would still be there, and I could walk/jog to my heart’s content without the pressure of finishing in a respectable time. 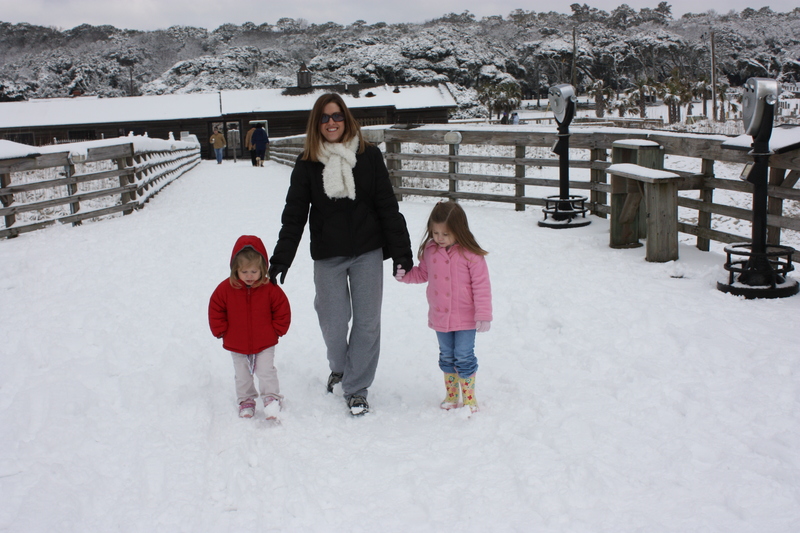 The next morning, we took Hannah and Sallie out in the yard to frolic in the snow a bit, and then we decided to take them to the MB State Park. It was indescribably beautiful. I’ll let the pictures speak for themselves. Anyone, including yours truly, who could witness that majestic scenery and remain miffed about the marathon cancellation could only be described as a first-rate grouch. Walking on the pier was a treat. 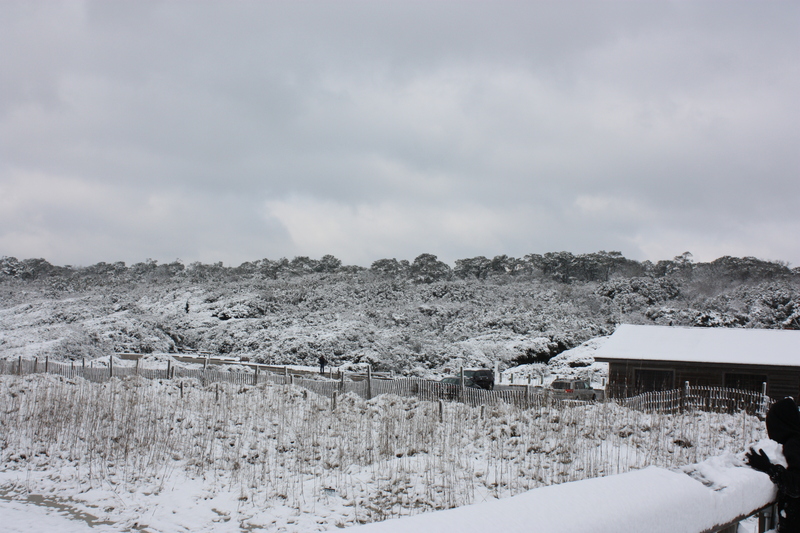 The winter wonderland was awesomely beautiful, and when combined with the beach itself…well, I have no words adequate to describe it. 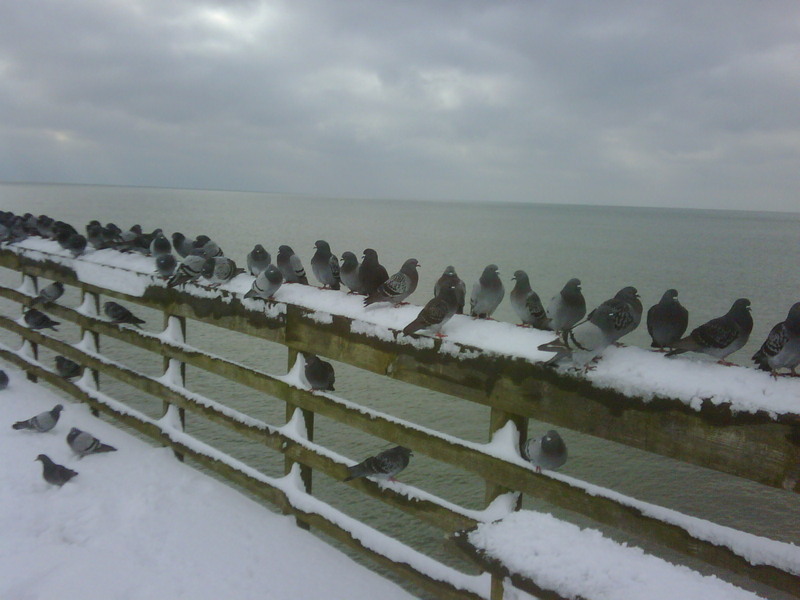 The little birds hunkered on the pier railings looked at us as if to ask, “What’s happening?? 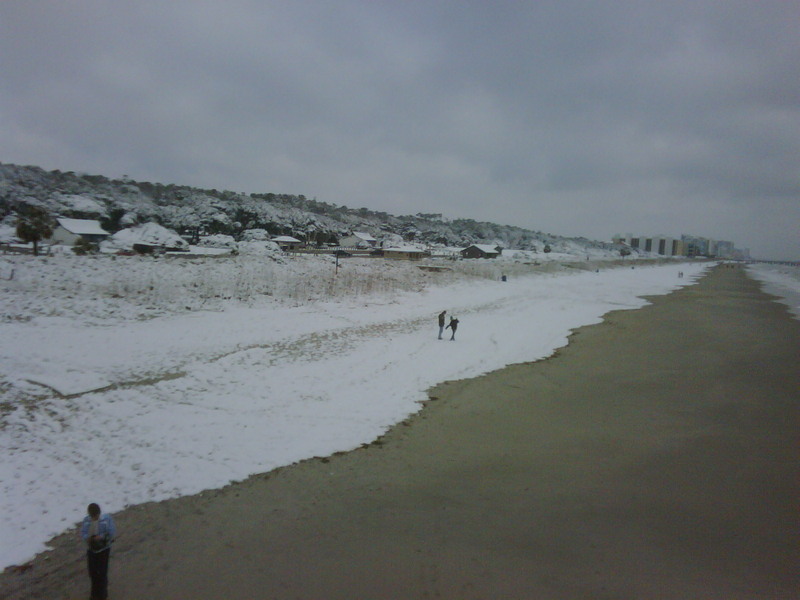 ?” The sandy line between the ocean and the snow was a sight I’d never seen and will probably never see again. 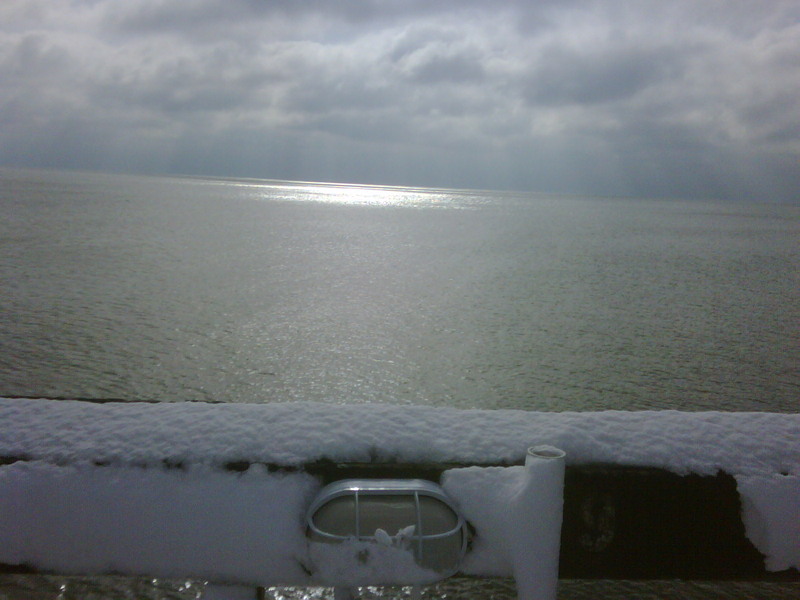 I even snapped a photo taken from the end of the pier that included the sun’s reflection in the ocean and the snow on the pier. To top things off, I met a fellow half-marathoner and new FB friend, Sandy Taylor. Somehow, talking to each other made the cancellation less disappointing. We walked through the gift shop and bought a couple of souvenirs and then walked down on the beach itself. That’s when I parted company with the rest of the family so that I could walk, walk, walk, and revel in the splendors of the beautiful morning. As I began my walk, Amanda called, and among other things we talked about Olivia, the precious baby that she’s carrying and my granddaughter. Great way to start my walk! I won’t go into all of my impressions and memories of that morning. I do, however, want to mention that although thousands of people who’d paid the registration fee were disappointed and perhaps angry about the cancellation of the marathon, hundreds attempted to make lemonade out of lemons as we walked, jogged, ran, hobbled, ambled, and sauntered along Ocean Boulevard, King’s Hwy, Market Commons, and the beach itself. Some walked/ran together while others participated solo. Some people whizzed by me like lightning while others sort of lumbered along. Still, I loved their spirit(s) of undaunted determination. Me? I walked 11.8 miles and took tons of pictures. When I got home, DH asked why I just didn’t go the distance. One reason is that I didn’t know how far I’d walked until clocking it in the car later, and the other reason (probably more important) is that I had to save some energy for shopping. That’s another whole story. For now, suffice it to say that Lauren and I found some super good bargains in Homegoods. Next year, I’ll register again. Why don’t you do the same? I only do the half-marathon these days (old knees, no time to train, etc. ), and I’ve read that it’s become the premier event. Your body recovers more quickly, and it’s not as grueling. 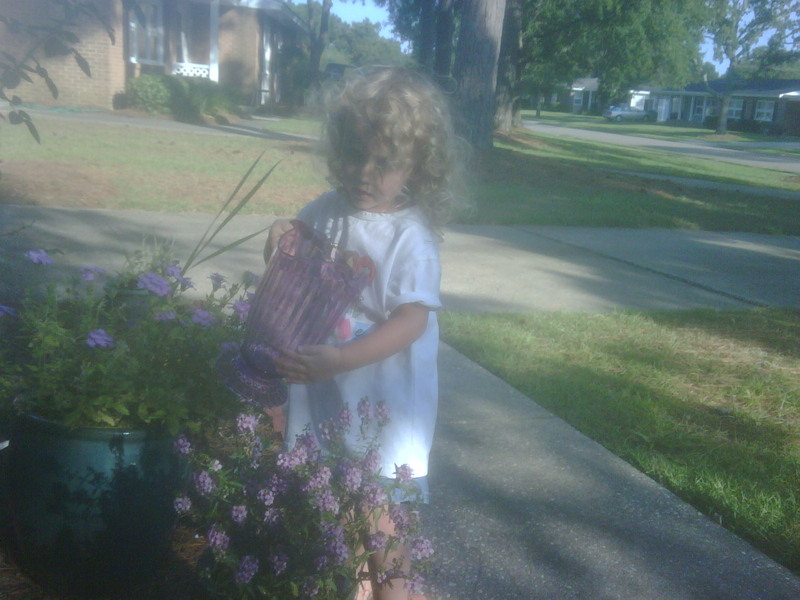 I told her that I was thinking about blogs and books and teaching and retirement and children and friends and religion. She’s a smart girl, that Annie, and she quickly turned my (our) focus to religious topics. She said that her pastor had begun a study entitled HABIT, an acronym for five words that the members were to try to incorporate into their lives. The H stands for HANG, as in hanging with God. To hang with Him really translates to hang out with Him, to find some quiet meditative time each day to better commune with Him. It could be reading and pondering the scriptures or some other inspirational books, or it could be quietly reflecting on the beauties of Mother Nature. Prayer too is a vital part of this hanging out process. When she had explained the HABIT practice a little more fully, I asked Ann if she remembered that quietude was my word of the year. Not the month, but the entire year of 2010. Yes, she remembered. “Are you going to write about it?” she asked. There’s so much to be said for spending a few minutes at the beginning of each day to get ourselves focused and calmed and ready for whatever the day might bring. My husband used to gently kid me about my obsession for solitude and once asked what he was supposed to say if someone needed to talk to me when I was getting my soul together. “Just tell them that,” I said. I think the idea scared him a little, but he’d be the first to attest to the fact that I’m a much, much happier person to live with if I can just have a little HANG time in the morning. Back to Ann. As she was whizzing down the highway with her beloved Allen on the way home from Hartsville last night, I read her a quote by Sue Bender from “A Lesson in Prayer” that sums up my feelings on the subject. She liked it, and I hope you will too.